Discarded cell phones account for nearly 65,000 tons of toxic waste each year. 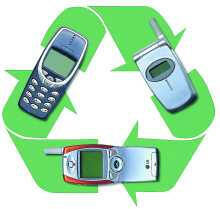 Cell phone recycling is critical because each improperly disposed cell phone can pollute up to 33,000 gallons of water. More than 500 million unwanted cell phones are either awaiting disposal in the home, or seeping hazardous lead, mercury, cadmium, brominated flame retardants, and arsenic into the environment. And with new features available every year, a cell phone's average life is now less than 18 months, adding more than 140 million cell phones (and their batteries) to our landfills each year — or 2.5 million toxic mobile phones dumped each week. Because the United States has yet to establish federal regulations requiring mobile phone recycling, only about 10 percent of cell phones are currently being donated or recycled. Recycled cell phones are also an important emergency link for women's shelters. Donated cell phones could save a life by enabling victims of domestic violence with instant access to emergency services. Before donating your mobile phone, erase any stored information, including your contact list, text messages, and listings of incoming/outgoing numbers. Most cell phones use a "master reset" to delete information quickly and easily. We will verify and master reset on arrival to our facility. Send Phone(s) in a simple padded mailer.